I remember as a sophomore sitting in an American Literature class when the professor starting talking about the advantages of attending a large university such as the University of Texas (hook ’em) versus going to a smaller institution such as Rice. I don’t know what brought on the lecture but he was adamant that we were receiving just as good of an education as those going to Rice. Furthermore, unlike the students at Rice, we would never run out of classes to take. It was nice to have a pep talk that we were going to get just as good of an education as those at Rice. (Before the Owls start emailing me, I didn’t say we all did.) And he was right about the choices. We could take our engineering physics lab just about any day of the week. I don’t remember ever having to wait more than a semester to have an opportunity to take a class. Well, I did wait three years to take biology but I had to take a specific section because of my degree. And yes, I was avoiding taking a class with a professor with a reputation for giving out very low grades. In my little group of friends, we had people majoring in Aerospace Engineering, Pharmacy, Linguistics, Architectural Engineering, Plan II, Sociology, Business, and Art. We had access to professions and accredited programs that weren’t available at smaller schools. I worked in one of the cafeterias with students from Indonesia, Korea, Kenya, and Denmark. Although there was plenty of room for improvement, we had students from just about every socio/economic level and racial/ethnic background. There were enough to form a meaningful support system. I’m not saying they always did or had the support of the administration but it was possible. We had fraternities, both social and professional, and more clubs than you could ever explore, I choose Judo over three or four other martial arts clubs. Of course there was big time TV sports, club sports, and intramurals. For racquetball leagues we had choices between singles, doubles, co-ed, women’s, or men’s. Smaller schools have a weekly campus newspaper, our campus newspaper was a daily and easily had 20 people in the newsroom every night. Major employers came to our campus to recruit so that all we had to do was sign up for interviews. We had alumni in virtually every city in the nation willing to talk to students about job opportunities. Now all of the above are just from my sliver of experience with a large university from a long time ago. Since then, many schools have improved their undergraduate education with first year programs, learning communities, and undergraduate research opportunities. Anyway, on the 50-50 list there are 89 universities with 10,000 or more full-time undergraduates. All but two are public institutions. A total of 78 are classified as Doctoral Universities, all but three with either high or highest research activity. Eleven are Master’s Colleges and Universities. 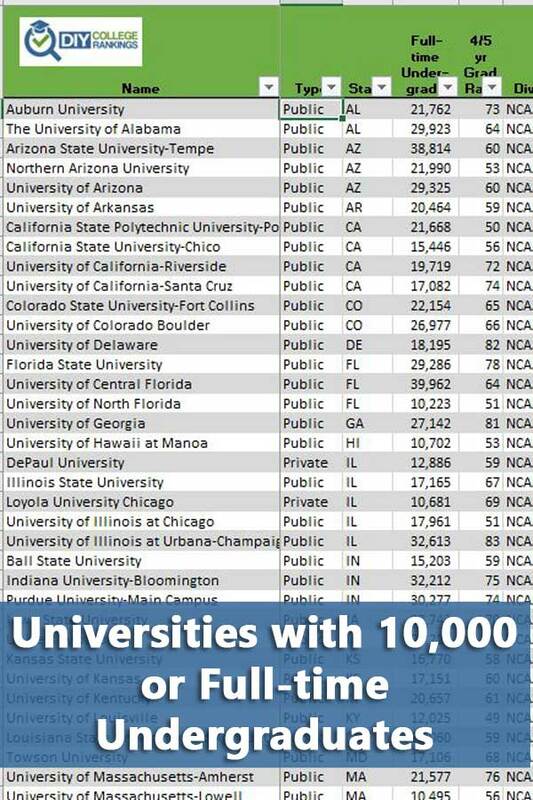 For those looking for big time college sports, 80 of the largest 50-50 universities participate in NCAA D1 sports. If it’s football you’re looking for, 58 are in the Football Bowl Series. As far as looking for academic peers, 46 of the large universities had 75th% SAT scores of 1300 or higher. 58 had a 75th% ACT score of 28 or higher. These scores are roughly the top 10% nationally. Given the size of the universities, this means even the most academically qualified students are likely to find peers to challenge them intellectually. North Carolina has the most large 50-50 universities with six followed by Illinois, Ohio, and Virginia with five each. A total of 18 states have only one university on the list and 8 states didn’t have any. As usual, the four-year graduation rate is used for private universities and the five-year for public universities. You can find all of this information in the DIY College Rankings Spreadsheet.